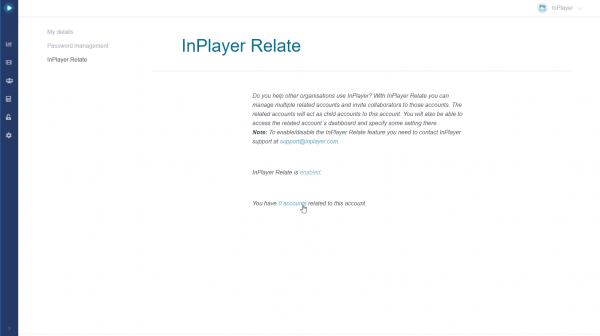 In the following guide, you will get more familiar with the InPlayer Relate feature. 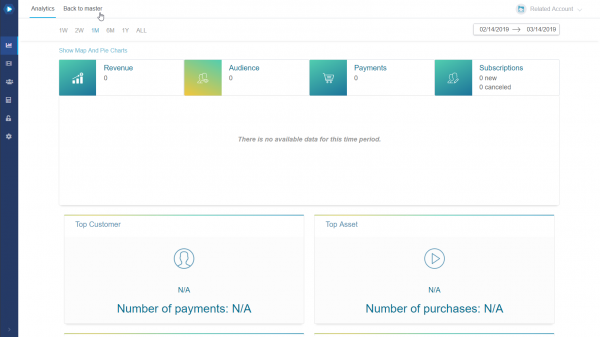 InPlayer Relate is a powerful tool that provides you with the possibility to have one main account and multiple sub-accounts. The main account is going to be your master account, and the sub-accounts will be the related accounts. You will be able to access the related accounts straight from your master account, without requiring a password for them. 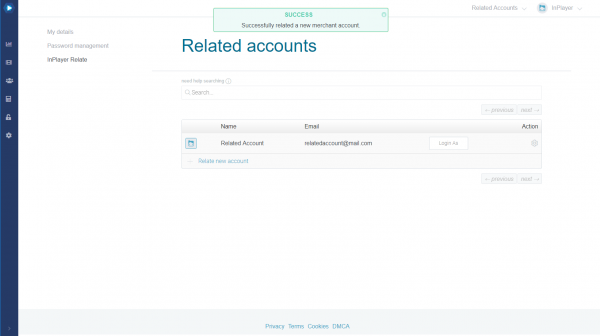 The Login As feature enables you to log into any of the related accounts via the master account, without requiring a password. 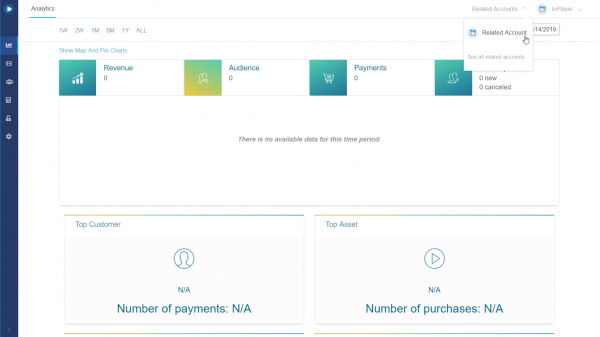 The Inheritance feature provides you with the option to have each related account connected to the payment settings of your master account. This means that all purchases made on assets from the related accounts will be subject to the revenue share and transaction fee that have been set in the master account. If you have Stripe Connect enabled on your master account and use the inheritance feature, all payments from the related accounts will be processed on your own Stripe account. To enable InPlayer Relate, contact your account manager or send us an email on support@inplayer.com. Once you get a confirmation that the feature has been activated, go to the InPlayer Dashboard and log into your InPlayer account. This is going to be your master account. 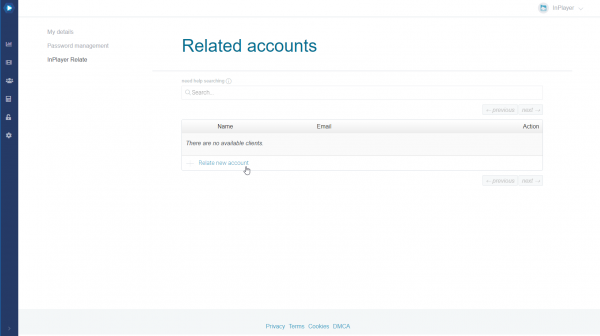 Then, go to the account menu in the top right corner and click on Account Details. You will notice the messages InPlayer Relate is enabled and You have 0 accounts related to this account. 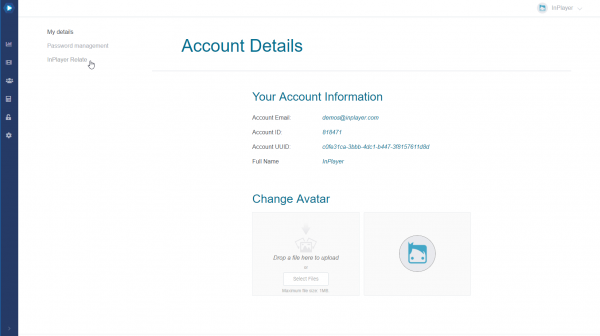 To create a new related account, go to the InPlayer Relate settings and click on 0 accounts (The number will change depending on how many related accounts you have). Then click on Relate new account. Email – the email of the related account. Full Name – the name for the account. Password – the password for the account. 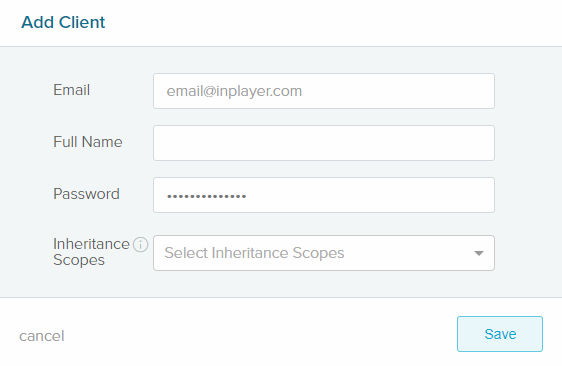 Inheritance Scopes – which settings will the related account inherit from the master account. At the moment, you can only choose a single setting: Payment Setup. 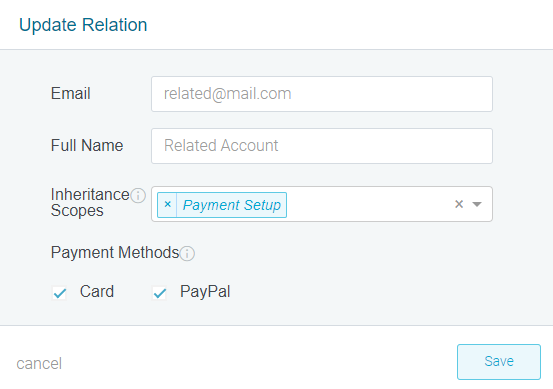 If you select Payment Setup, you can choose which payment method the related account will inherit from the master account. If you leave the Inheritance Scopes field blank, the related account will not inherit anything from the master account. When you’re done, click . You will see confirmation for the successful creation of the related account. To add an existing account as your related account, contact your account manager or our support team at support@inplayer.com. We will be able to connect an existing merchant account as your related account. Once done, we will let you know. Go to the InPlayer Relate settings and click on 1 accounts (The number will change depending on how many related accounts you have). Click on the button to the right of the account you want to disconnect and then click Remove Relation. Confirm the action buy clicking . You have now disconnected the related account from the master account. If you ever want to re-connect the two accounts, contact your account manager or send us an email on support@inplayer.com and we will do that for you. To manage the inheritance settings of a related account, go to the InPlayer Relate Settings and click on 1 accounts (The number will change depending on how many related accounts you have). Click on the button to the right of the related account you want to manage and then click Manage Inheritance. Modify the Inheritance Scopes settings to your liking, and then click . Note that it will take about 5 minutes for the changes to go live. Note also that if a new payment method is added to the master account after you’ve already set up some related accounts on it, you will need to go to the Inheritance settings for the related accounts and check the payment box for them, if you wish the related accounts to inherit the new payment method as well. This will not happen by default. To access your related accounts, first log into your master account. Then, click on the Related Accounts button in the top right corner, right next to the account menu, and select the related account you want to access. Enter the password of your master account and click . You will now be logged into the related account. If you wish to go back to the master account, just click the Back to master button in the top left. Remember that you can also access the related account like you would a regular InPlayer account, i.e. by going to https://dashboard.inplayer.com/ and logging in with the email and the password you’ve set up during the account creation process.